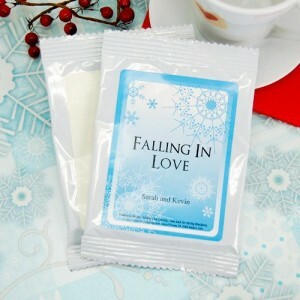 Nothing beats a steaming mug of cappuccino on a cold winter day and your guests will love these personalized packets. They’ll be a great addition to a fun gift bag for your guests – add a personalized coffee mug and a few of these cappuccino packets and you have the perfect favor for a winter wedding. Maybe you’re thinking about setting up a coffee bar at the reception? These would be a great addition to the bar – guests can take a few home and enjoy a nice mug of mocha cappuccino at home. You can find these personalized cappuccino packets here.